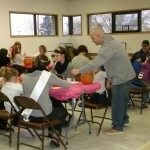 A pumpkin was the blank “canvas” for the creative artists that attended the 2014 Pumpkin Painting event on October 18th. 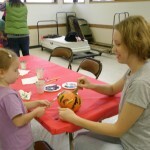 The two sessions saw many unique pumpkins: from monsters to minions to Olaf from Frozen. 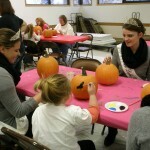 A big Friends of the Library thank you to Untiedt Vegetable Farms for the perfect pumpkins, the Howard Lake Royalty for providing encouragement to the painters and to artiste extraordinaire Marie for her designs and support. 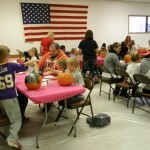 The painters enjoyed Kool Aid and cookies while their pumpkin art deried and also had a goodie bag to take home. 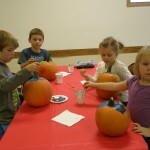 See you all next October!